Through Lora’s naïve but openhearted perspective, Paterson weaves in details about Cuban history and the events that led to the overthrow of the Batista regime and the rise of Communism...Paterson’s story is without political agenda, focusing instead on an improbable (and successful) literacy campaign and how it dramatically expands the world of one sheltered but determined girl. Paterson offers a glimpse of the daily life of a brigadista, redressing the cursory associations many have about Castro's Cuba. Hers is a positive study of an amazing moment in history that nonetheless acknowledges the darker political machinations at play...the themes of literacy, freedom, and community stay strong. Educational and inspiring. Readers will find that the strength of the book lies not in Lora’s adventures but in the critical question she asks: Which country is truly perfect? A fascinating...portrayal of a turbulent time in history. ...the issues and themes explored will raise questions, hopefully spark further research into Cuban history, and fuel discussion. Paterson offers a moving look at an episode in Cuban history. Motivational and clearly written with purpose and historical interest, Paterson's tale about the need for societal change and the positive impacts volunteering has for young people is important and intriguing. As always, Paterson eloquently delivers a fascinating slice of history, then gives her readers important points to ponder, making My Brigadista Year a gloriously timeless story. Lora will engage tween and teen readers who may seek out Lora’s inspiration, the work of Josè Martí, Versos Sencillos/Simple Verses (Arte Público Press, 1997). The story is well-written with a strong main character determined to show her worth in a world that has minimal expectations for a young teenager, let alone a young female teenager. A story written in the beautiful way that only Katharine Paterson can achieve, I also learned a lot about Cuba’s history and got a taste of what life must have been like in 1960s Cuba. This story is of the personal determination that risked comfort and safety to bring those desired changes for others. It’s an inspiring, eye-opening, and courageous story that will impact its readers and bring an awakening to each person’s place in society. In this idealistic and informative coming-of-age novel, readers experience alongside Lora her triumphs and challenges as she exchanges her sheltered city life for the experience of living on a farm and seeing how learning to read and write changes lives...Lora’s story helps readers see how the Cuban people’s resilience and fortitude overcame extreme hardship. This beautiful, powerful, and surprising book gives insight into a Cuba most Americans have never seen and into the life of a young girl willing to risk everything she has to share her love of the written word with others. A fascinating, insightful and exciting work of historical fiction, My Brigadista Year is thought-provoking and profound on many levels. —Kendal A. Rautzhan's "Books to Borrow . 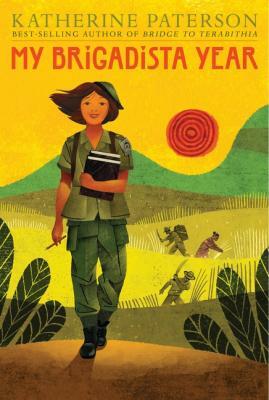 . . Books to Buy"
Based on historical events and the accounts of actual brigadistas, this is a fascinating story that brings into focus the dramatic experiment which raised the literacy rate in Cuba from 60 per cent to 96 per cent in one year. Paterson, now living in Vermont, has written a novel which will inspire young readers by demonstrating the difference one committed person can make in a community.